The South Korean Electronic Giant launches LG K7 and LG K10 Smartphones in India today. Both the phones shall be manufactured at Greater Noida manufacturing unit of the company. These are budget phones for average to elite Indian consumers. 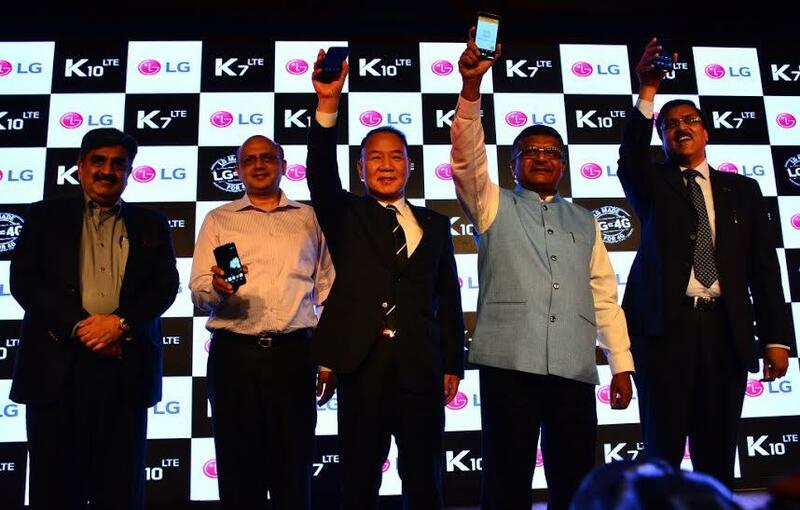 LG, the South Korean Electronic manufacturer launches K series of Smartphones LG K7 and LG K10 in India today. The LG K7 will be available for Rs 9500/- only; while LG K10 is priced at Rs 13500/- These are the first smartphones from LG to be manufactured at a fully automated facility at Greater Noida based plant near New Delhi. The New LG K7 features a 5-inch display. It has snapdragon processor and 1.5GB memory. Android 5.1 is powering the applications. You can take awesome Selfies with 5 MP front Camera. 8GB of Internal storage is enough to work on the Cloud, catch glimpses from holidays and store media files. Build your own music library and tune in whenever and wherever you want. You can choose from 3 vibrant colors i.e. Titan, Gold, and White. The phone will offer 4G and VoLTE support. If your appetite for smartphone is really bigger than average then you can consider the LG K10 variant. The new LG K10 features 5.3 inch HD display with in-cell touch technology and is powered by Snapdragon processor. Want to store a movie and watch later? Well, it has 16 GB storage to fulfill your gadget appetite and comes with 4G and VoLTE support. 2 GB memory ensures that you can do multitasking while on the go. Stream media files, do social networking and write emails, all at same instant without having a complaint about a slow phone. It has a 2300mAh battery. The LG K 10 shall be sold in three colors White, Indigo, and Gold. So you can keep a solid grip on your LG Phone, both K7 and K10 features 2.5D glass on the front. The special slide cover adds to having glimpses of calls etc along the side of the display. When the phone is locked but you want to use Camera simply Press Down the volume button. In my opinion, LG K7 should be a suitable phone for average users while for business and multitasking LG K10 should be a better choice. LG in India works under business name LG Electronics India Pvt. Ltd. i.e. LGEIL. The company has a manufacturing unit in Greater Noida. This unit is most eco-friendly among all LG manufacturing facilities in the world.